Before you can C.A.S.T.- Your walk better match your talk. Acts 2:6-20- If they put me on trial for being a Christian, would there be enough evidence to convict me? Now, let me explain why Dad and I were amazed when we read this. 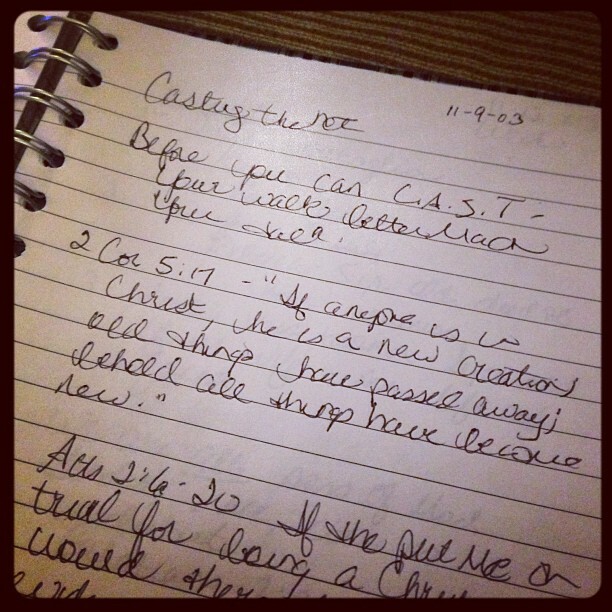 Mom wrote this entry 10 years ago (2003), and just a few weeks ago Cudd (the church I grew up in & my family still attends) started a new college ministry called CAST. For years and years Mom prayed fervently for Cudd to have a thriving college ministry. She prayed for the ministry and for the college students. So, it is definitely a God thing that what Mom was writing about 10 years ago, is the name of the ministry today that she prayed so so much for! At Passion 2013, I fell in love with Ephesians 3:20, “Now to Him who is able to do immeasurably more than all we ask or imagine, according to His power that is at work within us.” Louie Giglio preached on this, and after that conference, that verse has been my prayer. I pray that God will use my life to do immeasurably more for His glory, but I’m not gonna lie, I get kind of impatient waiting for the immeasurably more to happen. That’s what God taught me with this entry we found of Mom’s… He taught me that it might not always be in His plan for me to see the immeasurably more. God used Mom’s life to do immeasurably more for His glory, but still there were things she prayed for, such as a thriving college ministry at Cudd, that she didn’t get to see before Jesus took her home. God is still doing immeasurably more through Mom’s life, even after she has passed away. I still pray for God to do immeasurably more through my life, but that night, He reminded me that it might be in His plan for me not to get to see the immeasurably more. Therefore, I need to stop getting so impatient and frustrated if I don’t see immeasurably more ASAP! God’s timing is best and His plan is best! If you’re praying and waiting for God to do something, remember this lesson that He taught and is still teaching me. Be patient and wait for God’s timing. You never know, He might just use your life for immeasurably more even after you have gone home to be with Him!